Readers may have come across Yoda and his handler Marcus in recent weeks around campus. 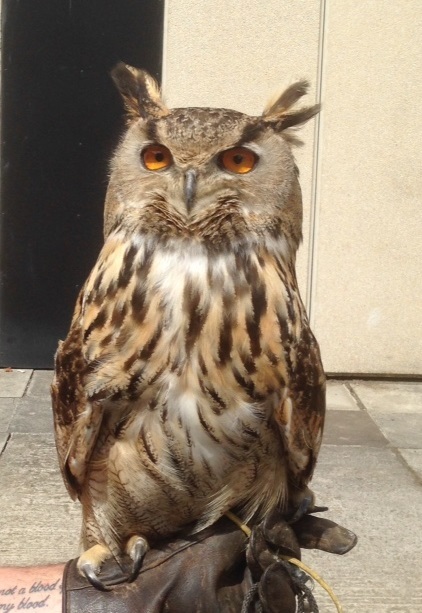 The Estates department have invited Yoda to visit the campus twice a week in order to make his presence known to the seagulls that reside on campus here. During his visits, Yoda’s presence has the effect of unsettling the gull population and thereby dissuading them hanging around on campus and from nesting further in the area. The regular visits aim to make the university environment less appealing to pest birds. Yoda is employed as an environmentally friendly method to control the seagull numbers on campus and thereby limit the potential adverse effects a large gull population can have. For example, gulls can become territorial and aggressive during nesting periods. And as gulls will scavenge almost anything edible, they would be sure to become a nuisance for university staff and students enjoying lunch outdoors. Yoda is currently 7-years old and while he could be expected to live for up to 20 years in the wild, Yoda could potentially live to 60 years. 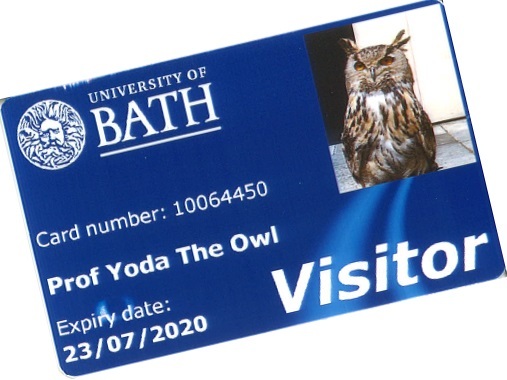 In recognition of his valuable service to the campus, the Library Management team agreed to issue a library card to Yoda the Eagle Owl.